It’s not that “Gangster Squad” is a horrible movie. It’s just that the trailer wets your appetite that you are going to see a movie along the lines of “Goodfellas” or “The Departed” and this doesn’t come close. A great cast for sure with Sean Penn, Ryan Gosling, Josh Brolin, Michael Pena and Emma Stone but it takes more then star power to make a good movie. It takes a good script and the stars have to come off as believable. The last comment is a slap against Penn who plays mobster chieftain, Mickey Cohen like he’s a rabid dog who grunts a lot and makes ugly mean faces. Penn used to be such a good actor and played great roles in “Falcon and the Snowman” and “Milk”. And nothing will ever top his character, Jeff Spicoli in “Fast Times at Ridgemont High” But in this movie he over acts like no tomorrow. “Gangster Squad” is loosely based on real events from the late 40’s and early 50’s when Cohen was to L.A. what Al Capone was to Chicago 20 years earlier. He takes over the mob business and has most of the cops, politicians and judges in his hip pocket. But then along comes Nick Nolte as an honest top cop who decides to take on Cohen’s gang. Nolte, by the way, also over acts and makes you pine for the days when he was on top of his game like during “Rich Man Poor Man”. Nolte puts together a squad along the lines of Elliott Ness’s “Untouchables” but, again, the acting is wooden. Brolin is the ring leader and he also overacts but does display fighting skills like Mike Tyson. As for Gosling and Stone they are pretty faces but don’t have the chemistry like they did in the recent “Crazy Stupid Love” (love that movie). The movie plods along with a predictable ending in store with plenty of bullets flying all over the place. 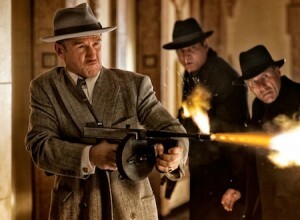 Again, “Gangster Squad” is not awful but it’s also not very good and it rates – a double – two stars on my report card.